Home renovations are both an expense and an investment rolled into one. As a result, they require discipline, due diligence and the equivalent of a metric-tonne of research. On the expense side is the money spent on repairs and maintenance—the price paid to keep our properties in good condition in order to stave off the inevitable depreciating value of a home. On the investment side is how the dollar spent helps to increase the current fair market value or prolong the useful life of the home. Now, I can tell you that a $1 spent isn’t a $1 earned when it comes to remodels and upgrades. For the most part, the money invested in alterations and improvements is always greater than the money spent on repairs and maintenance. (According to a Desjardins report, released in 2012, the division of these costs accounted for 76% of dollars spent versus 24%, respectively.) In the same report, Desjardins’ Chief Economist, Francois Dupuis, also found that the value of the home renovations in Quebec surpassed that of new builds in 2013. Dupuis wrote: “This finding holds true whether we use current dollars or constant dollars (no price effect).” We can only assume that similar results would be found in the rest of Canada. Obviously, the home renovation market should not be taken lightly. Who’s investing in home renos? 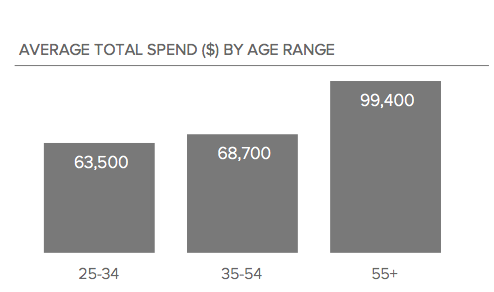 Go back five or more years and the Baby Boomers were the demographic cohort leading the spending spree. But over the last half decade the baton was passed—now millennials are leading the home reno charge. “It’s an interesting trend that’s begun to emerge,” explains Liza Hausman, VP of community at Houzz.com. According to a survey released last year by Houzz.com, there are a few differences in the way Baby Boomers spend on home upgrades and how millennials spend their remodel dollar. “Becoming homeowners later in life means millennials are not waiting as long to do their renovations,” says Hausman. “They have a pent up demand. They want to customize and personalize their space, so they tend to renovate much sooner.” That said, millennial renovation budgets tend to be much smaller. “They tend to take on more DIY-projects,” says Hausman. 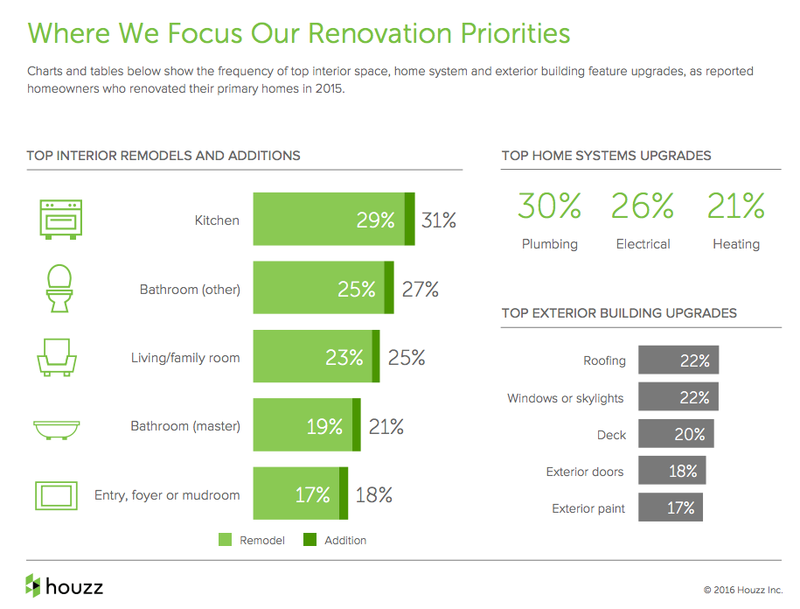 Remodels, as opposed to additions, still dominate the reno plans however more and more homeowners are spending on system upgrades with 30% replacing plumbing pipes, 26% upgrading their electrical service and 21% updating their heating and ventilation system. Contrary to popular opinion, most homeowners aren’t loading up on cheap debt in order to pay for their renovations. This, according to the results of the Houzz.com survey. Apparently, 76% of survey respondents said the money for the upgrades came from savings or personal finances. Only 8% admitted to paying for an upgrade through cash from a mortgage refinance, while another 19% said the funds came from a home equity line of credit. Could there be trouble ahead? Perhaps the scariest response was that 20% admitted to putting their home reno/upgrade on their credit card—a debt that would be paid off over time. Even worse was that almost a third (31%) of homeowners didn’t bother to make a reno-budget, while another 29% admitted to going over their budget. While there’s a large segment of finance geeks that would provide a quick, simple answer to home reno costs—”Don’t do it!”—this ignores the reality that homeowners can and will renovate to suit their tastes and needs. Instead of relying on an austere approach, let’s consider ways to reduce the costs of a home renovation. One simple and effective way is to research both the renovation and the costs before hiring any trade or lifting a hammer. Experienced contractors are continually espousing this advice: The more you research, and get a realistic expectation of what things will cost, the easier it is to stay on budget. Another simple way to stay on budget is to develop and stick with a plan. Changing renovation designs mid-way is a costly endeavour—one that’s easily avoided. When setting your budget, makes sure you include the extras—permit costs, GST, temporary accommodation and a contingency fund. This last expense should be at least 10% of your overall budget. For instance, a kitchen renovation with an overall budget (including GST) is $50,000, so add another $5,000 as part of your contingency fund. This money will be used should you run into difficulties. Consider where you’ll get the money for your home renovation project. The best way to ensure you will get maximum value is to save up for your dream project. Not only does saving up mean you don’t have to go into debt, it means that you get the full value of any upgrade you do. Since, home upgrades rarely offer a 100% return on your invested dollar, getting full value typically means gaining $0.35 to $0.85 on every dollar spent on the reno project. Go into debt to pay for the project and you decrease that return even further. If, however, you do plan on financing your home reno project I strongly advise against using using high-interest loans, like those offered on credit cards. While it’s so easy to swipe and forget, the cost of this type of loan can quickly add up. For instance, if you were to pay for a $5,000 bathroom decor update using your credit card that carried a 20% interest rate, and only paid the interest on the purchase, it would take you 25 years to pay off that debt. Worse, it would cost you more than $9,000 in interest payments. Instead consider a loan, line of credit or refinance your mortgage. This loan uses the equity in your home, up to 65% of your home’s appraised value. The benefit is it gives you ongoing access to funds at a low interest rate (most are currently between 2% and 4%). Better still, you have the option of interest-only payments, that help free up cash in particularly tight financial times. Keep in mind, however, you’ll pay interest on the funds you end up using, plus the interest rate will fluctuate depending on the lender’s prime rate. If you’re near the end of your mortgage term or rates have dropped significantly since you locked in your term-rate, consider refinancing. This option not only allows you to start a new mortgage at a lower interest rate, but let’s you add additional funds to the borrowed amount—up to 80% of your home’s appraised value. Like a HELOC, you’re borrowing against the equity in your home, but at a fixed length of time (also known as an amortization term). If you’re planning on completing extensive renovations that include heating upgrades, new windows and doors or better insulation, consider getting an energy audit. The first step is to complete a home-energy audit—a test that will tell you how energy efficient your home is (or isn’t). The audit can cost anywhere from $100 to $800, depending on your city, your home and the company you use. Once you get the audit, you’ll have a report of your inefficient systems and components, and suggested upgrades to make. Review the list and see which ones align with your remodel plans. Once you’ve completed and paid for these improvements, you can submit receipts and paperwork to various federal, provincial and municipal rebate programs. It can take up to a year to get the rebate money, but it still feels pretty good to get money back on a renovations you were going to do anyway.